Microsoft’s freshly announced decision to add all Microsoft Game Studios exclusive games to Xbox Game Pass at launch caught the industry by surprise, to say the least. It’s a bold move and also an unexpected one. To begin with, it will translate in losing a lot of full price sales for all the exclusives from Sea of Thieves going forward. Then again, Microsoft is clearly playing the long game here with the subscription model. Let’s evaluate why this is a calculated risk. We’ve covered this topic over and over again during this console generation: the software output from Microsoft Game Studios has been disappointing so far. Moreover, the three biggest IPs (in addition to Forza) in the entire portfolio won’t even get new mainline entries this year. I’m obviously referring to Fable, which is now rumored to be in development at Playground Games but won’t be ready for quite a while yet. Then there’s Gears of War – a new chapter is certainly coming from The Coalition, but likely not before 2019 as Gears of War 4 only launched in October 2016. Finally, 343 Industries suggested earlier this month that the highly anticipated Halo 6 (or whatever it will be called) won’t be coming out this year after all. 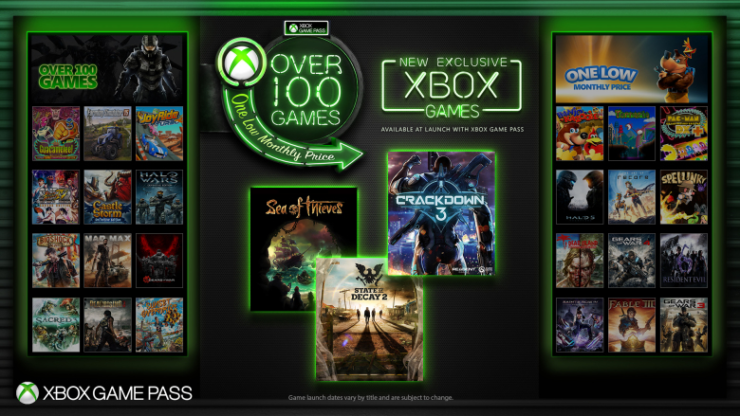 As a result, the current first-party schedule is ideal to launch on Xbox Game Pass as none of the titles would have been easy million sellers anyway. Sea of Thieves is a brand new IP and a peculiar kind of game, too. State of Decay 2 is the sequel to a game originally released on Xbox Live Arcade and from what we’ve seen so far, it still won’t be triple-A material in terms of production quality; Crackdown 3 is reviving a franchise that’s been dormant for years now. According to VGChartz Crackdown 2 barely passed the million mark, not to mention that Crackdown 3 has been delayed multiple times and suffered from negative hype due to the yet-to-be-demonstrated cloud powered multiplayer mode. In short, Microsoft isn’t likely to lose a tremendous amount of money by bundling these titles with Xbox Game Pass. On the upside, all these games will benefit tangibly from the far larger player base they’ll be exposed to as they are all more or less focused on multiplayer, whether it’s co-op or competitive. That’s exactly where Microsoft’s initiatives over the past couple years or so start making perfect sense when considered as part of a larger plan. For starters, the decision to bring all of their first party titles to PC via Windows Store and then to double down on that by activating the Xbox Play Anywhere program to enable cross-buy and cross-play with Xbox One. This move immediately exposed those games to a much larger audience, with everything that entails. While Windows Store still isn’t where it needs to be to appeal to the core PC gamer, there’s a huge untapped potential there to be unlocked. Xbox Game Pass will indeed work on Windows 10 PC for Xbox Play Anywhere games, Microsoft confirmed. All of these plans will converge on the overarching goal to massively expand the Xbox Live community, which Microsoft calls Monthly Active Subscribers (MAU) and labels the ‘health metric of any service’, more so than sales figures. And there’s the last pillar: focusing on the Game-as-a-Service model with Phil Spencer stating that service based games dominate the industry nowadays. With the GaaS model that’s being used for most (if not all) games under the Microsoft Game Studios label, the focus on full price sales isn’t paramount anymore. We’ve seen it before with titles such as Ubisoft’s Rainbow Six Siege, which was no big performer at launch but eventually became important for the company as a large community formed and the so-called recurrent consumer spending skyrocketed. That’s right, microtransactions and in-game purchases (not necessarily tied to the dreadful loot boxes, mind you) are the lifeblood of GaaS and in all likelihood how Microsoft plans to make Xbox Game Pass work. While they may not get $60 anymore from a fairly small subset of fans when a new game is released, they will take the XGP subscription on a monthly basis from a much larger pool of gamers and then bolster revenue through recurrent consumer spending. With all those games bundled in everyone’s XGP library, it should be rather easy to entice players to come back together to a certain game when a new update drops and then get them to spend money once there. As mentioned in the article’s title, though, this wouldn’t necessarily work as well with Sony or Nintendo. That’s because almost all of their first party content is designed to stand out and possibly become a blockbuster hit. For example, both The Legend of Zelda: Breath of the Wild and Horizon: Zero Dawn are now headed for the five million units sold mark and it’s easy to imagine a similar level of success for upcoming titles like God of War, Spider-Man, Pokémon and Metroid Prime. It would definitely be harder for Sony and Nintendo to justify launching an XGP-like program featuring all those exclusives at launch day when they could otherwise get $60 each from millions of gamers. That’s even more evident once you consider how their line-up is comprised, by and large, of single player games. Both companies have given no sign that they’re going to adopt the GaaS model anytime soon, which means that they could not count on recurrent consumer spending to make up for the lost revenue. Millions of gamers would just subscribe for one month when their favorite games drop, complete their single player campaigns and then unsubscribe. It just wouldn’t make sense financially. It will be intriguing to see how these opposite ideologies clash together on the market. There’s no doubt that Microsoft, perhaps more than ever, needs to deliver strong first party content to entice players into subscribing (and keeping an active subscription) to Xbox Game Pass. If they manage to do that, it could be a fertile ground to explore which rivals Sony and Nintendo won’t be able to colonize easily without restructuring their content pipeline first.